If I then sewed his arm back on so it worked perfectly, he would be back to his Brownlow medal winning best. 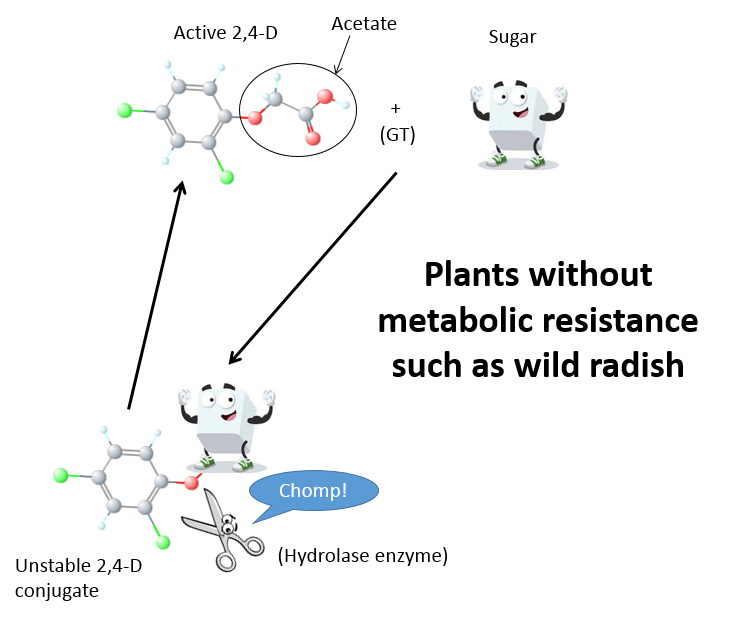 This is sort of what happens with 2,4-D in wild radish and explains why metabolic resistance is not the mechanism of wild radish resistance to 2,4-D. We now know this thanks to some painstaking research by Australian Herbicide Resistance Initiative (AHRI) researcher, Danica Goggin, with funding from ARC and Nufarm. The short story here is that resistance in wild radish to 2,4-D is not metabolic resistance. 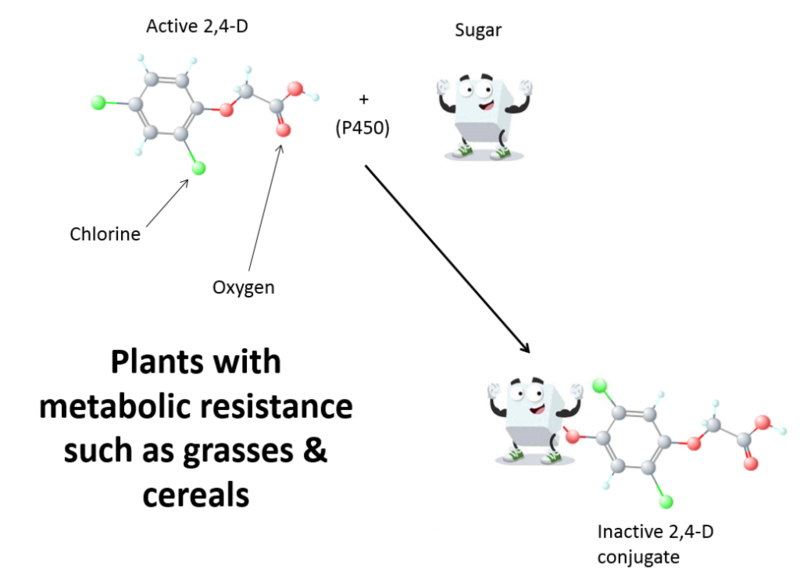 The longer story is much more interesting and explains how this works in wild radish, and how 2,4-D tolerance in grass plants is (partially) through a metabolic process. Ever wondered how grasses tolerate 2,4-D while broadleaf plants can’t? One of their weapons is P450 enzymes. P450 is short for cytochrome P450 mono-oxygenase. In other words, they are enzymes that add an oxygen (in the form of hydroxyl) onto a molecule. In this case, as you can see in the diagram below, when 2,4-D enters a grass plant, the P450 enzyme adds an oxygen to the carbon ring and then a different enzyme called a GT (glucosyl transferase) binds the sugar to this oxygen molecule. Now we have a great big molecule that doesn’t look or act much like 2,4-D anymore and it no longer works as a herbicide. If you have very keen powers of observation you will also see in the diagram below that during this process one of the chlorines moves from position four to position five on the carbon ring. So, we could now call it 2,5-D. The 2,5-D in this diagram has a big sugar bound to it, stopping it working, and other studies have shown that 2,5-D (without a sugar bound to it) also has no herbicidal properties. The cartoons below were prepared by Danica to help the rest of us understand some pretty complex science. Danica’s research was focused on understanding if wild radish could tolerate 2,4-D by metabolic resistance mechanisms. She found that it couldn’t and is unlikely to in the future. 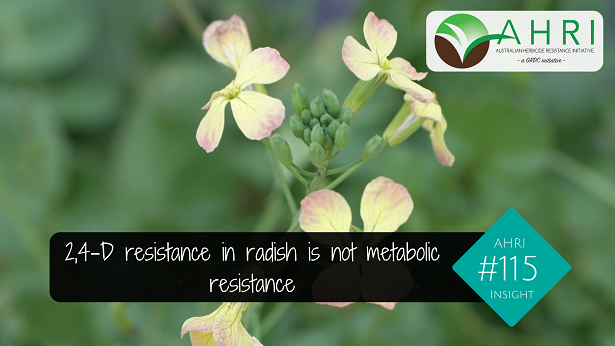 Danica studied 13 populations of wild radish, two susceptible populations and 11 with 2,4-D resistance. The diagram below shows that something super cool happens when 2,4-D enters the wild radish plant. The GT enzymes knock the acetate off the carbon ring and join a sugar onto the freed-up oxygen sticking off the ring. We now have the 2,4-D carbon ring with a sugar bound onto the side. Now this is the cool bit, the plant then snips this sugar back off the carbon ring with a pair of scissors (called a hydrolase), the acetate joins back on and voila, 2,4-D is returned to its original state and it can wreak havoc as a herbicide. This is a normal function in the plant. Remember that 2,4-D is an auxinic herbicide, they mimic naturally occurring auxins in the plant. Auxins regulate growth and the plant needs to keep the auxins at the right level by switching them on and off again. One of the ways plants do this is by the process mentioned above. Joining on a sugar to switch it off for a while, then cutting the sugar off to make it active again. You may wonder why we bother to understand herbicide resistance at this level of detail. Well once in a while it has a pay-off and this is a good example. Scientists have recently developed 2,4-D tolerant cotton and soybean using a bacterial gene to modify 2,4-D. If metabolism isn’t causing 2,4-D resistance then what is? In a previous edition of AHRI insight we told the story of some of Danica’s early research where she found that reduced movement of 2,4-D between cells was the mechanism of 2,4-D resistance. But it is never that easy, there is just about always another mechanism. Danica then went on to test another 10 populations of 2,4-D resistant wild radish and found that four of them had reduced movement of 2,4-D and six had something else. The something else mechanism is the focus of more research by Danica and others. It looks to be something to do with auxin perception, and more research will confirm exactly what is going on. This is some pretty crazy science that is helping us understand our oldest herbicide, 2,4-D. If we could cut off a footballer’s arm and sew it back on again we could regulate his ability as a player. In the same way, all plants regulate auxin (and 2,4-D). The difference between resistant wheat and wild radish is that wheat P450s can act on 2,4-D, while radish P450s cannot. Wild radish has had to find another, sneakier way to become resistant.